These easy Boston and New England recipes will let you enjoy regional flavors straight from your own home kitchen. Enjoy a taste of Boston and the New England coast - wherever you happen to be! With these recipes, you can easily make authentic New England clam chowder, Boston cream pie, lobster rolls, and other traditional dishes. Plus, you can re-create contemporary favorites that you may have enjoyed in local Boston restaurants . . . Italian marinara sauce, grilled swordfish, French olive bread. 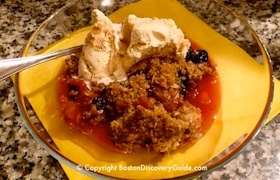 Or create home-style dishes such as New England stuffed pumpkin and fresh fruit crisp. 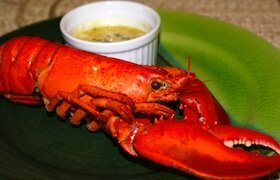 I've even included instructions about how to eat lobster (without making a huge mess). All of these recipes are my own versions of Boston and New England classics - and that means they're quick, easy, and virtually foolproof because they've been "tested" many times by my family and friends. The flavor of these regional favorites relies on healthy, fresh ingredients that you can buy locally at Haymarket, ethnic markets, the Boston Public Market, and neighborhood farmers' markets. You can easily make them too! 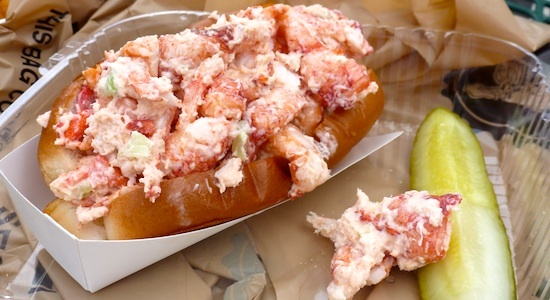 Lobster rolls represent summer in New England. 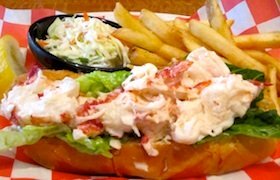 The best ones feature chunks of lobster overflowing the roll and contain only minimal other ingredients, so that nothing interferes with the fabulous taste of lobster. This lobster roll recipe tells you how to make this treat from a freshly-cooked New England lobster. Nothing could be simpler - or more delicious! Wish I had one right now! Almost every restaurant in Boston serves New England clam chowder, a creamy soup ideally made with fresh clams and local potatoes. 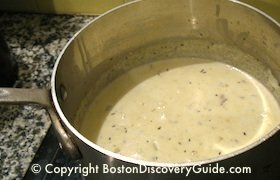 To enjoy a taste of Boston with minimal effort, make this easy New England clam chowder recipe on a cold winter day - a bowl of chowder can be a meal. And in the summer, offer a cup as part of a New England shore dinner. New England is full of luscious fresh fruit and berries from summer through fall. This Fresh Fruit Crisp makes the perfect way to serve them as a dessert. Add ice cream on top, and everyone will want seconds. I like to use fruit from Boston's Haymarket, local farmers markets, or one of the nearby pick-your-own apple orchards for the crisp. Best of all, it's very easy to make! To Boil . . . Or to Steam? How to Do Both! If you're going to make lobster rolls or eat a whole lobster at home, you'll need to know how to cook it. This usually means putting it into a pot and boiling or steaming it. Which is better, steamed or boiled? 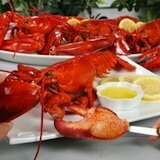 Each method of cooking lobster has its fans, so I'll tell you how to both. You can try each one, and decide which method you like the best. If you're a fan of Boston Italian restaurants in the North End and across the city, you know that a great marinara success is at the heart of this cuisine. With this delicious marinara sauce recipe, you can make your own homemade tomato sauce for a taste of Boston right in your own kitchen. 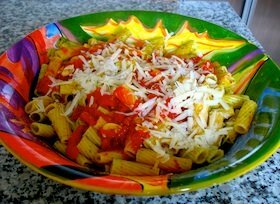 Serve it with pasta for a great meal summer or winter. 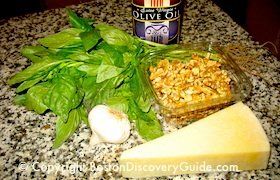 Pesto made from basil, garlic, nuts, and romano cheese appears in many forms in Boston's Italian and French Mediterranean restaurants. Boston cream pie, first created by a French chef for the opening of the city's Parker House Hotel in 1856, is the official Massachusetts state dessert and a huge local favorite here in Boston. 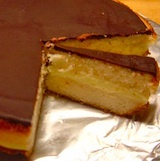 You'll be surprised by how easy this Boston cream pie recipe is to put together . . . and your family and friends will beg you to make it again and again. I share a few shortcuts - so you can make the "authentic" version, or a quick version perfect for mid-week dinners. Boston is called "Beantown" for good reason. Ever since the Colonial days when Boston was part of the Triangular trade in molasses, rum, and slaves, molasses has found its way into the local cuisine. 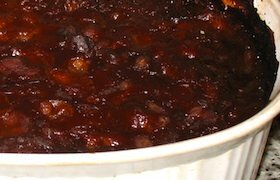 Beans baked with molasses and salt pork became synonymous with Boston cuisine. This baked beans recipe recipe is delicious, easy, and reasonably authentic. This baked pumpkin recipe is the perfect fall 1-dish meal. Make it when sugar pumpkins become available at your local market. 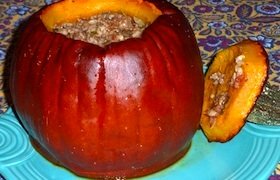 In this recipe, a savory blend of North-African flavors, lamb, and vegetables enhance the sweet pumpkin after slowly baking for 2 hours. Whether you're dining on a whole lobster in a fancy Boston seafood restaurant or enjoying one at home with family and friends, the red-shelled creature on your plate can look intimidating if you don't know how to tackle it. But don't give up! 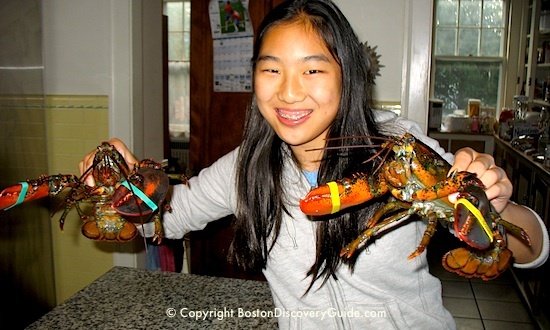 You'll find the process very easy when you follow my detailed instructions for how to eat lobster. Local fish, fresh off the dock, are one of the biggest New England seafood treats. Lots of local restaurants feature swordfish steaks - in fact, they're almost as popular as beef in Boston steakhouses. 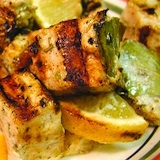 Happily, swordfish is very easy to prepare at home, and is especially delicious when cooked on a grill. This grilled swordfish recipe describes how to prepare this treat from the sea. This is one of the easiest Boston and New England recipes, and one that you'll want to make again and again. You'll find examples of local cuisine in most Boston restaurants. For traditional favorites and fresh off the boat seafood, head to Union Oyster House. You can enjoy contemporary Boston and New England specialties in many of the city's Italian and French restaurants. And to enjoy Boston Cream Pie right where it was first served over 150 years ago, visit the famous Parker's Restaurant in the Omni Parker Hotel Boston.